Combination Hanger with Adjustable Clip Bar.. Plastic Adult Sized Hangers. 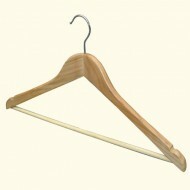 Pack of 8..
Hangers Walnut Finish with Grip Bar..
Wishbone Notched Wooden Hangers Pack of 10&nb..